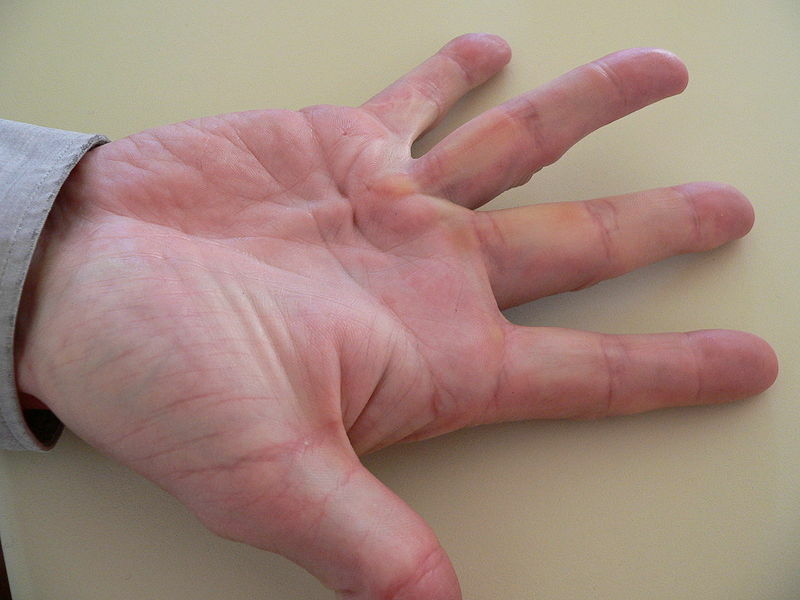 A Dupuytren’s contracture is a common condition* involving contraction of the longitudinal palmar fascia. Typically starting as painless nodules, fibrous cords and flexion contractures develop at the MCP and interphalangeal joints, which can severely limiting digital movement and reduce patient quality of life. The condition is around six times more common in men, with peak onset aged 40-60yrs. It most commonly affects the ulnar digits (ring and little finger). *Similar clinical conditions have also been described involving thickening of fascia in other body areas, such as Leddarhose disease (Plantar fibromatosis), Peyronie disease (Penile fibramotosis), and Garrod nodes (Fibramotosis of dorsal proximal interphalangeal joints). The condition involves a fibroplastic hyperplasia and altered collagen matrix of the palmar fascia. 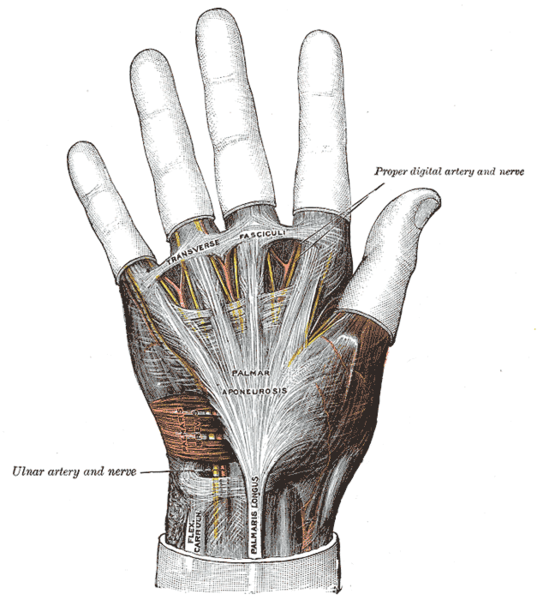 This compositional change leads to a thickening and contraction of the palmar fascia. Whilst the condition is considered idiopathic, there have been association made to certain genetic and environmental factors in the disease process. Patients will present at varied stages of progression. Symptoms may therefore range from reduced range of motion and nodular deformity through to a complete loss of movement. The ring and little finger are most commonly involved; however, the other digits may be involved. The condition is bilateral in 45% of cases*. On examination, a thickened band (Fig. 2) or firm nodule adherent to the skin may be palpable. Skin blanching may occur on active extension of the affected digits. In advanced disease, the MCP and/or PIP joints of the affected digit may be in contracture. Hueston’s test is a specific test that can be performed for such patients; if the patient is unable to lay their palm flat on a tabletop, this is a positive test. Important differential diagnoses to consider in patients presenting with the condition include stenosing tenosynovitis (often painful and associated with overuse or trauma), ulnar nerve palsy (associated with reduced movement/strength and loss of sensation), or trigger finger (nodule present associated with finger motion). No imaging is required for the diagnosis, although ultrasound imaging can be used for increased accuracy in applying intralesional injections (discussed below). The management is mainly dependent on the stage of presentation. Patients who present early with no functional disability can be monitored and treated with conservative management. More invasive treatment is usually considered when there is functional disability or rapidly progressive disease. Patients are advised to undergo hand therapy*, keeping the hand active with multiple stretching exercises throughout the day. *Both the use of radiotherapy or steroid injections are not routinely recommended for early Dupuytren’s disease. Surgical procedures for Dupuytren’s disease involve the excision of diseased fascia. Surgical management is typically indicated in those with functional impairment, MCP joint contracture >30 degrees, any PIP contracture, or rapidly progressive disease. Closed fasciotomy (also termed percutaneous needle fasciotomy) is a less commonly performed procedure. It has the benefit of being performed in the outpatient setting under local anaesthetic and hence is more suitable for co-morbid patients who are unsuitable for major surgery. Finger amputation is very rarely for Dupuytren’s contracture, only ever considered in very severe cases where there has been a delay in presentation and failure of initial management. The course of the disease is variable and not all disease progresses to contracture. However, most patients will eventually require surgery and, whilst surgical intervention has excellent functional outcomes, post-operative recurrence has been reported up to 66%.